Calling all men (Junior High and up) to join us for the viewing of “Kingdom Men Rising.” This 90-minute film explores what it means to be a real man in the midst of cultural trends in which there is confusion about masculinity. Kingdom Men Rising takes a journey that challenges men to rise above what we have become to lives of no more sitting on the sidelines, no more passivity, and no more excuses. Through the stories of several men, the film drives us toward God’s ultimate purpose for masculinity and design for men. Featuring author, pastor and speaker Dr. Tony Evans, Grammy-award winning entertainer Kirk Franklin, Heisman trophy winner Tim Brown, former Dallas Cowboy quarterback Jon Kitna, Super Bowl winning coach Tony Dungy, NFL vice president Troy Vincent, author Priscilla Shirer, and others, Kingdom Men Rising provides an honest portrayal of today’s man that is countered by God’s original design. This event is made FREE by Hope Evangelical Free Church in Fertile. Light refreshments will be provided. Learn more about this film. Also showing in theaters April 29th & 30th. 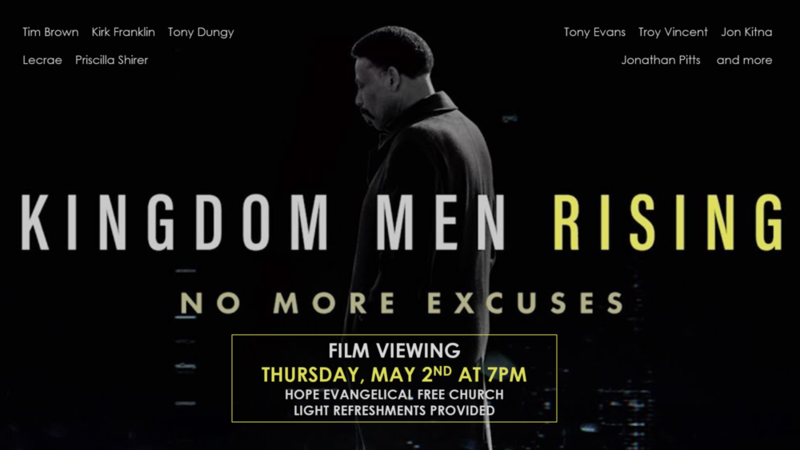 Thank you for signing up to join us for the viewing of Kingdom Men Rising. We’re looking forward to a great evening for the men at Hope and in the community to be challenged and encouraged. Please reach out to other men in your life and invite them to join you! All men junior high age and up are encouraged to attend.